Since the late 90s, the All-On-4 dental implant procedure has been refined and made more widely available throughout America and the world. Not only did this procedure prove to be more effective than traditional dentures, but it provided a permanent solution to missing teeth. At Same-Day Implants, we are happy to provide this revolutionary procedure for patients who would benefit. However, before making any final decisions, we always perform a comprehensive exam using state-of-the-art cone beam 3D CT scans, digital x-rays, as well as a full oral exam. Keep reading to learn more about the benefits of All-On-4 dental implants. When a single-tooth implant procedure is performed, the crown is supported by one dental implant. However, oral health experts have discovered that with precise placement of dental implants in the jawbone, a full arch of teeth can be supported by only four dental implants. Not only is this procedure better for patients, but it’s much easier for periodontists to perform, meaning they can often complete the procedure in one day! Let’s take a look at some of the main benefits of All-On-4 dental implants. Above all else, All-On-Four dental implants are a permanent solution to your dental woes. For many people, old and young, tooth decay and tooth loss is a huge threat to their well-being. Although dental implants will fully restore the functionality and feel of your natural teeth, gum disease and peri-implantitis are still very real threats, so it’s important to maintain your implants the same as you would your natural teeth. Most people don’t experience what it’s like to have a brand new set of teeth during their lives, but the ones who do are rarely dissatisfied! According to a study published in SciELO, 91 percent of patients treated with implant-supported prostheses were overall satisfied with their experience while other studies show even higher degrees of satisfaction months and years after their procedure. It’s never easy living with decaying or missing teeth. Not only do you have to deal with the reduced functionality, but a reduced confidence level as well. Since full-arch prosthetic teeth are pre-made, they are designed to look exactly like your real teeth and blend in seamlessly with your gum line. Most people are surprised to find out that the patient doesn’t have any of their natural teeth which can be a huge confidence booster! The most important reason to have an All-On-4 Procedure done is the restored functionality. Chances are, you have fond memories of being able to eat what you want, when you want it; or, maybe you’ve never experienced this. Either way, All-On-4 is the only effective way to restore the strength and bite force of your natural teeth. What makes the All-On-4 procedure so unique is its ability to restore full functionality with limited intrusiveness. 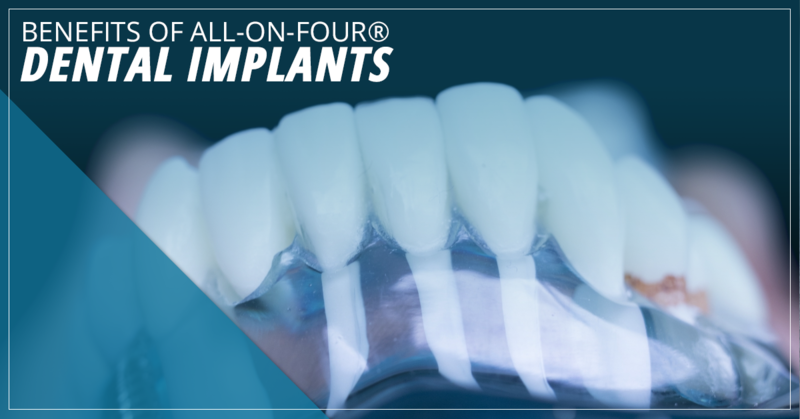 Instead of all implants being placed straight like with single-tooth or multiple tooth replacement, the two outermost implants are slanted, increasing the bite force they are able to withstand. Without this, a full arch prosthesis would need more than four implants to support it. When a tooth falls out, the process of resorption begins. What this means is that bone tissue is lost in the jaw because it’s no longer supporting a tooth. This causes the jaw to have a “sagging” appearance and can only be restored if the teeth are replaced. All-On-4 will increase bone tissue production in the jaw resulting in a more natural shape. Behind functionality, this is often one of the biggest concerns patients have. You don’t have to live with less than optimal tooth function and appearance. All-On-4 dental implants are the most effective way to restore your natural feeling teeth. The best part of all is that you may qualify for a same-day implant procedure, meaning you could be walking out with a brand new pair of teeth with no downtime, all in the same day as your initial consultation! Don’t hesitate to give us a call and schedule an appointment. How Does Periodontal Charting Work?